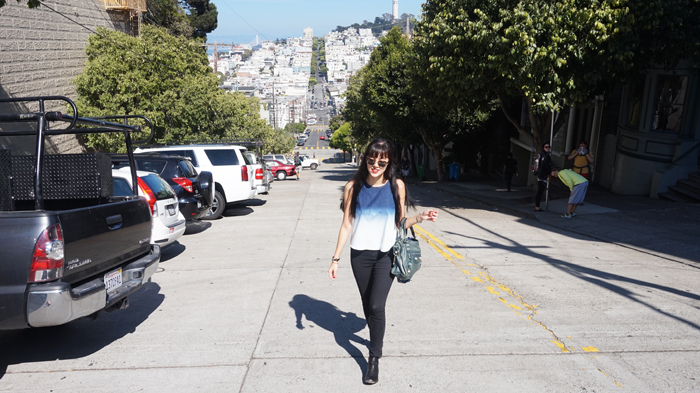 Happened to be in San Francisco on the same day as my old friend Sherry so that was exciting! 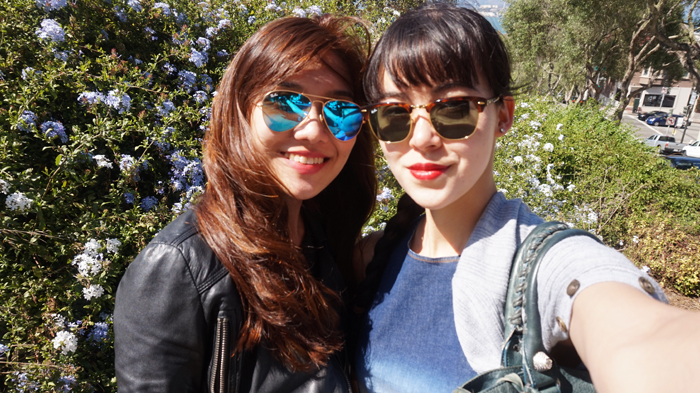 We bunked in together for 2 nights & went sightseeing on the one full day we had. Also, all pictures below are from her camera! Kinda pricey really & as I said to Sherry, it would probably have cost us less to take cab from point to point. Most of the touristy spots (I'll list them below) are located very near each other, which makes walking between them the easiest mode of transport. 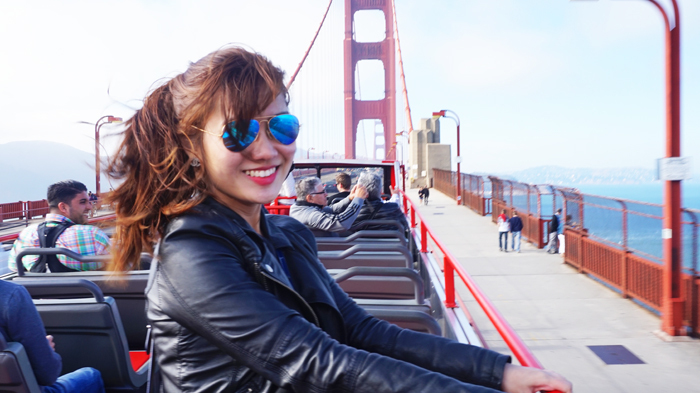 The only exception would be the Golden Gate Bridge, so essentially we paid 35USD to have an open-air/top-down ride through the Golden Gate Bridge! Quite an exciting experience so I'm undecided on the final conclusion of whether the tour was a waste of money or not. First stop was the Fisherman's Wharf! 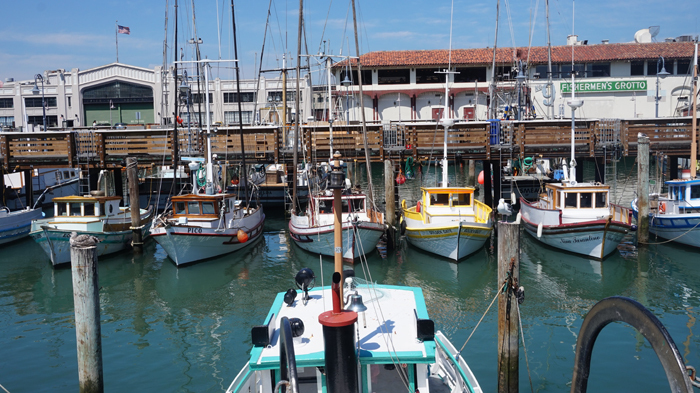 Fisherman's Wharf & Pier 39 are almost synonymous & they pretty much consist of lots of restaurants! The specialty here would be the clam chowder, which can be found on the pier. Sherry also tried this very famous fish & chips place called The Cod Mother & she highly recommends it! It's a casual sorta-food truck & is located a bit further in Fisherman's Wharf (not along the pier). Another point of interest would be the sea lions suntanning on floating wooden platforms! Kinda cute but also pretty noisy & sometimes smelly haha. From the edge of the pier you can also spot the island of Alcatraz. P.S. Alcatraz tour tickets are usually sold out, so book in advance! From here we began walking towards Ghirardelli Square. A small beach! You'll actually see people swimming here, which is sort of strange because so many people are walking past all the time & it's right beside big ships & restaurants. 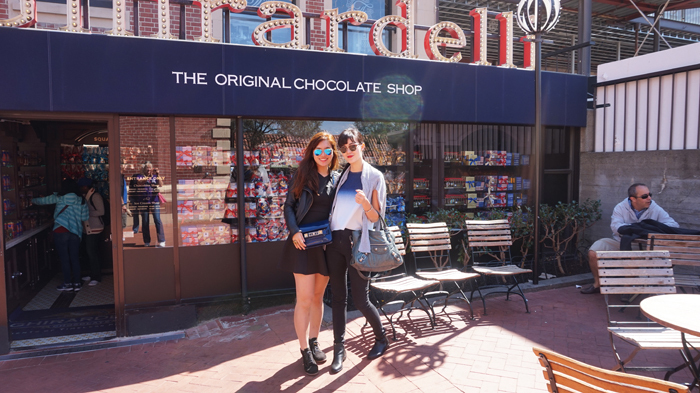 Arrived at Ghirardelli Square! 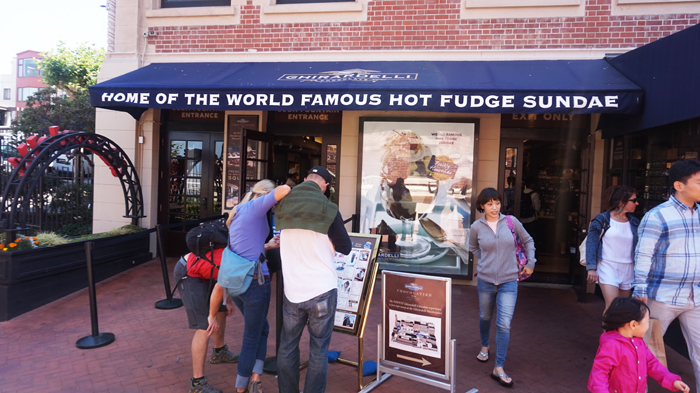 Ghirardelli is a chocolatier & at Ghirardelli Square you can find both his dessert restaurant as well as his chocolate shops (along with other unrelated shops & restaurants). Quite a nice place to check out! As the shop awning says; we had to try it! There can be quite a queue here but luckily when we arrived we managed to get a table almost immediately. There was a queue when we left though! 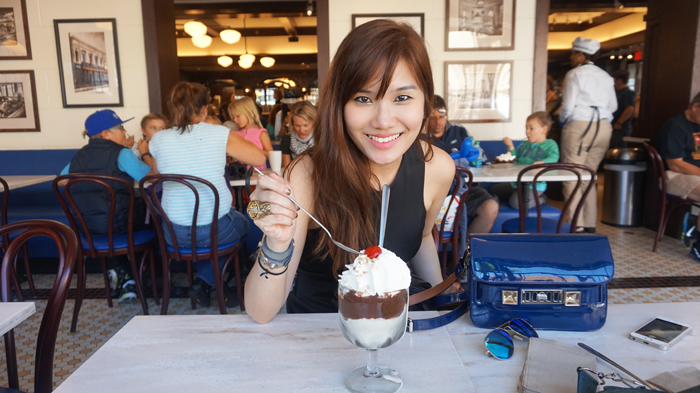 I'm actually not a huge fan of sundaes (don't like chocolate syrup) but it really was pretty good! The Original one cost us 11.50 USD but they have many other concoctions that sound yummy. From here we began making our way towards Lombard Street! 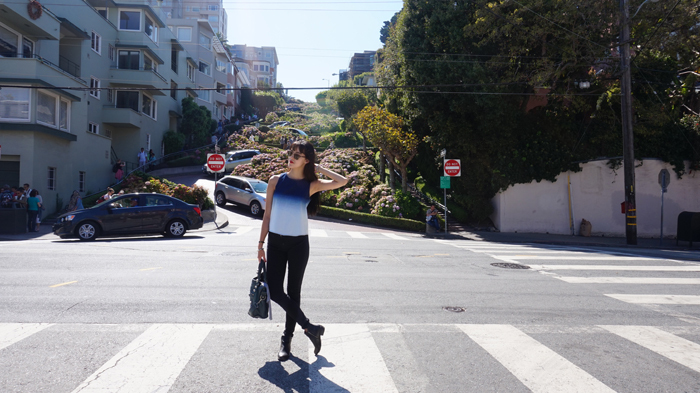 Lombard Street is actually quite long, but one section of it is the famous Crookedest Street! 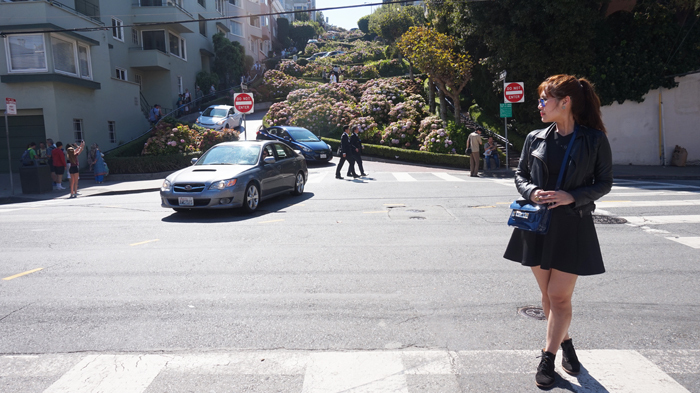 To get there it was quite an uphill climb... San Francisco is crazily hilly! 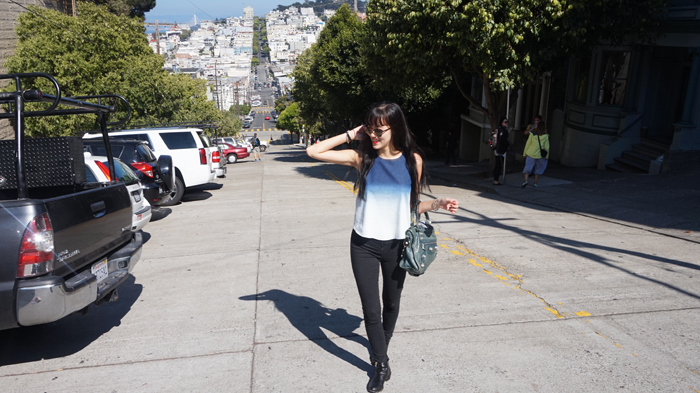 Anyhow we made our way up the area that is known as Russian Hill. Had a great view of the harbour though! 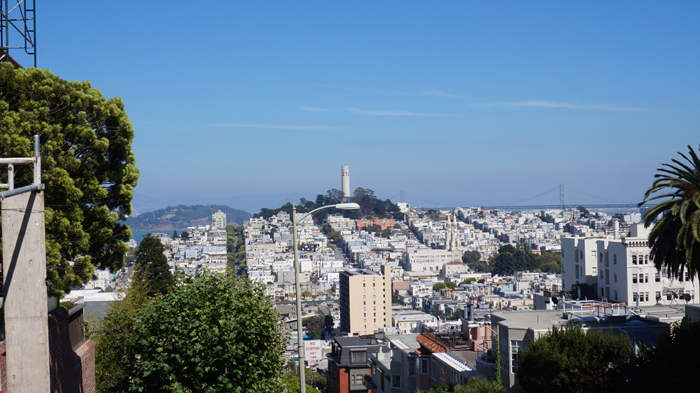 Finally reached the top & opposite us we could spot Coit Tower - another tourist attraction! It was most recently featured/mentioned in the movie San Andreas (based mostly in San Francisco). Coit Tower is named after a lady called Lily Coit & the city built this tower in her honour after her passing to commemorate all her efforts in supporting the San Francisco firefighters. And here's the famed Crookedest Street in the World! Naturally the traffic going down it is pretty slow (precisely what it was intended for), especially as you'll spot lots of tourists driving down it with a GoPro/camera in hand to film the descent. The entire crooked section is lined with really pretty flowers though! There are also houses lined along the way & I can't imagine the ruckus they must face from tourists climbing up & down the steps on the sides of Lombard Street. A Thai tourist had his camera snatched from him & when he gave chase, the robbers shot him! This happened about 12pm & traffic was closed till about 3pm while police searched for the suspects. From here you can spot how uphill & downhill it is! 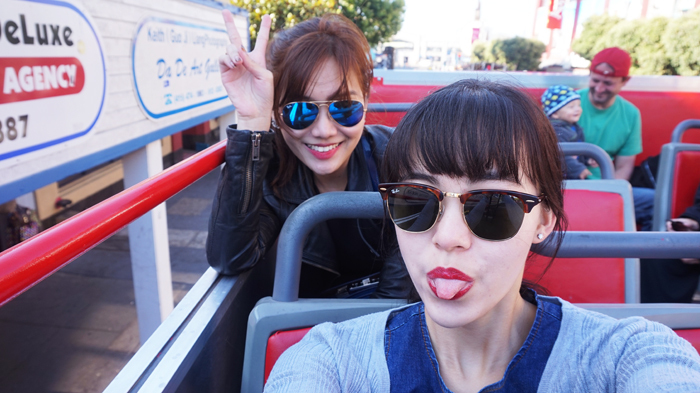 After this we walked downhill back towards Fisherman's Wharf & waited to get picked up by our Hop-on-Hop-off bus, which arrives every 30 mins. 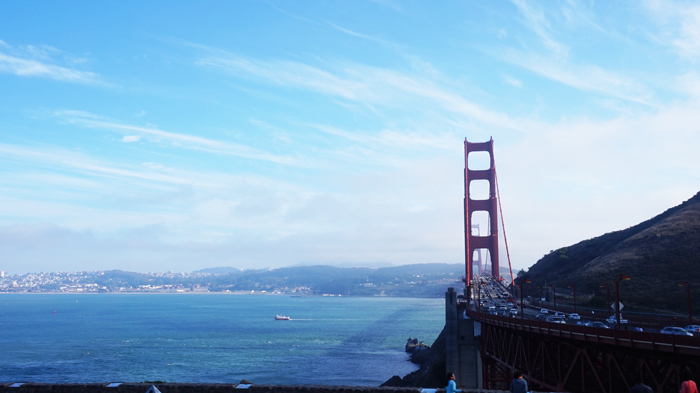 And finally for our last stop - the Golden Gate Bridge! 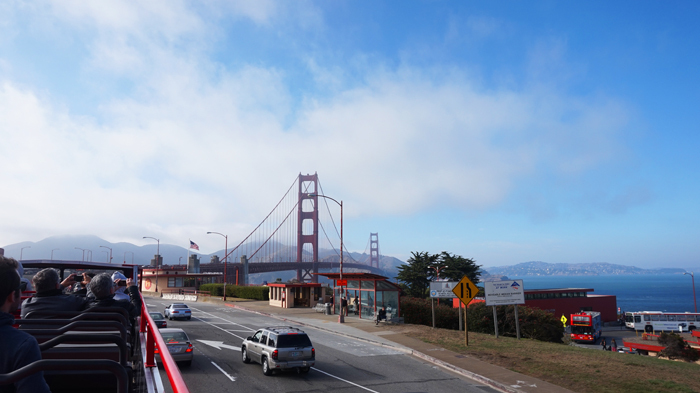 I actually visited the Golden Gate Bridge in December 2014, where I cycled 2 hours from Fisherman's Wharf right up the Bridge. It was a crazy uphill trip so by the time we made it to the Bridge we were pretty tired! We only cycled about 1/3 of the way on the Bridge itself (which is very long, by the way) before calling it quits as the idea of cycling back across the Bridge wasn't too appealing either. This time I had the tour bus to bring me across & back! We sat on top to get a good view but it was crazily windy! Any loose items on you at this point WILL most certainly fly off. The view is fantastic but I was miserably cold... The wind permeated every bone in my body *dramatic* My teeth were chattering & my eyes teared from the wind whipping across my face... But I guess the view/experience was quite worth it! The only person crazily happy about the wind haha. Here's the view from the other side of the Bridge! The tour bus will stop here for a few minutes at this lookout point for everyone to take pictures. And I guess that's about it for touristy stuff! The bus dropped us back near Union Square, which is the big shopping area. All-American diner/breakfast food & mean pancakes! It's apparently not THAT popular with locals, but I feel the food is pretty good, there's a huge variety so that's great for groups & prices are very reasonable (about 10-20 USD per person). Serves many, many mains as well as cheesecakes of course. 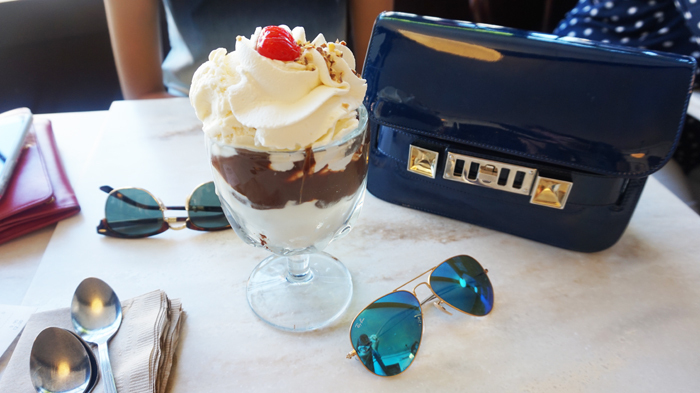 The food here is very rich & comes in huge portions, so it's great for sharing! The Caesar salad is good, as well as the pastas. Pretty pricey though, dinner for the 2 of us came up to 70USD (2 mains + 2 cheesecakes)! The fish & chips place Sherry mentioned to me & it seemed pretty life-changing for her haha. I saw how it looked like & it's basically a permanent food truck with a decent-sized eating area (an open-air space with wooden picnic tables), reasonable pricing as well since it's casual dining. 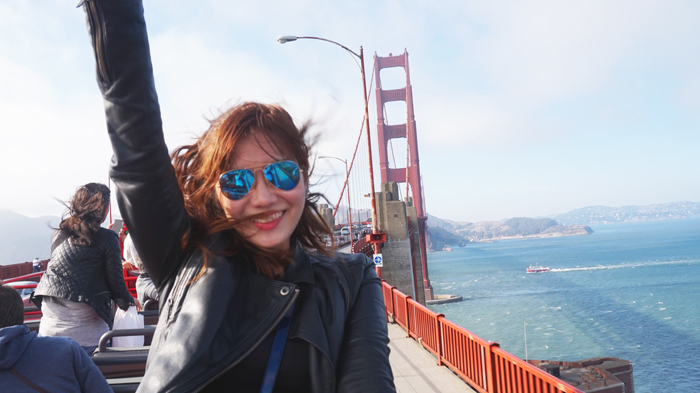 So that's for the major touristy things in San Francisco! You can also check out Chinatown & Little Italy, but these are more just areas to walk through with nothing specific/in particular to see. I passed by both on the tour bus & that seemed enough. Oh yes & of course Alcatraz (both day & night tours available), which is a bucket list item! 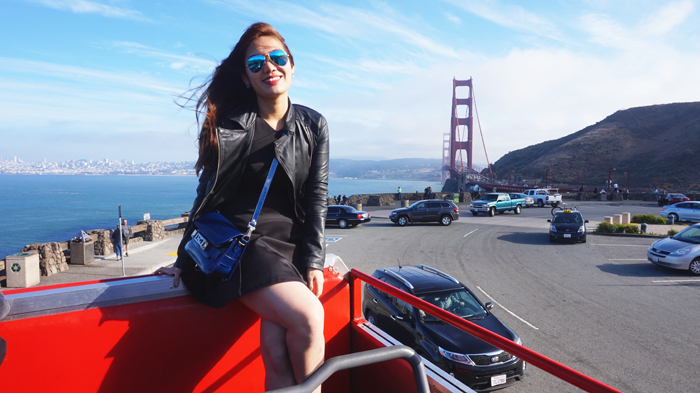 If I had to pick just one spot to visit, I'd say Fisherman's Wharf! 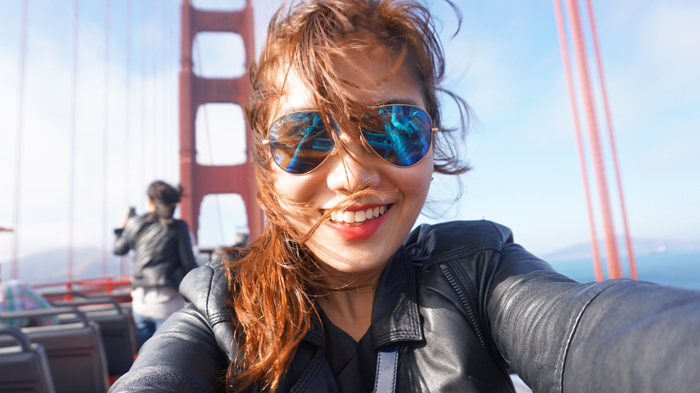 Very bustling, lots of food & street buskers & from here you can spot Golden Gate Bridge + Alcatraz from afar hahaha (if that counts). Oh & you can take a ride on one of the 2 tram lines left (which is now just a tourist attraction rather than an actual form of transport), which costs 7USD! For me I simply took a picture with it when it was stationary... One end of it can be found near Union Square (be prepared to queue). 5 comments on "Travelogue : San Francisco"
Lol precisely because they're so normal around the U.S. that foreigners like us want to try it! 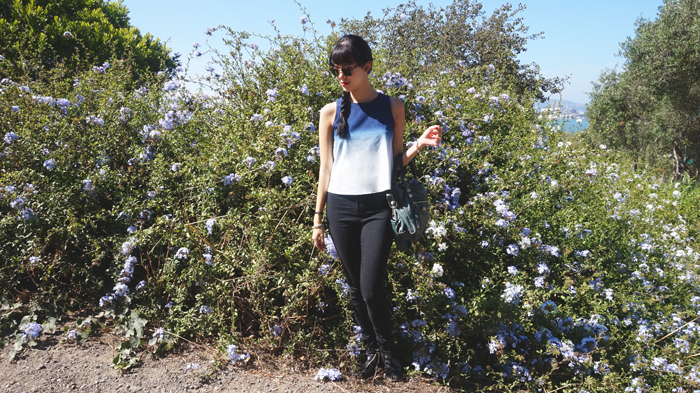 Just came across this blog. What do you do? 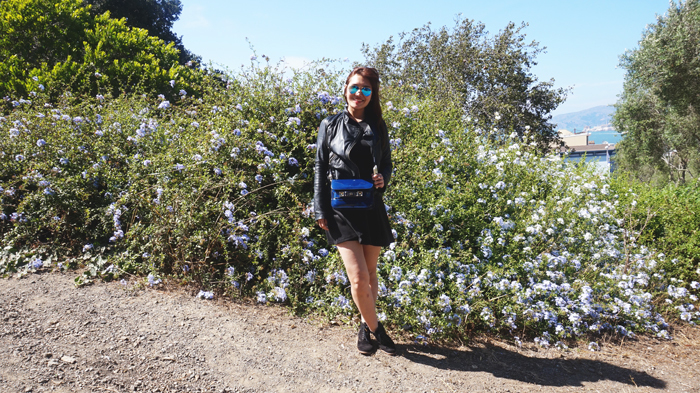 Are you a travel blogger? 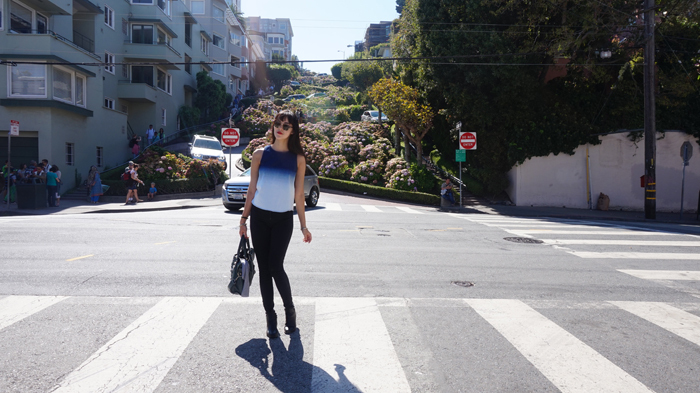 Lombard isn't actually the crookedest street in the world. 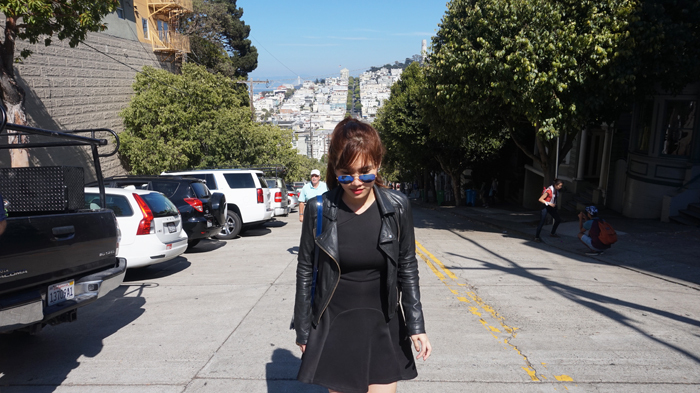 It isn't even the crookedest street in San Francisco. That distinction belongs to Vermont street in the Potrero Hill district, between 20th and 22nd streets. 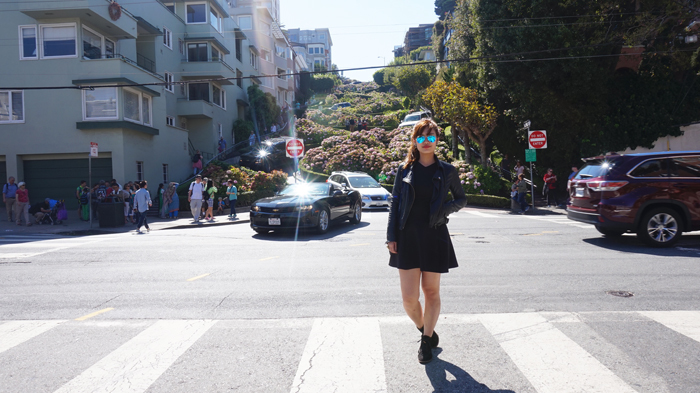 However, its location isn't as "tourist friendly" as Lombard, so Lombard is given the title of "World's Crookedest Street" to attract the visitors. 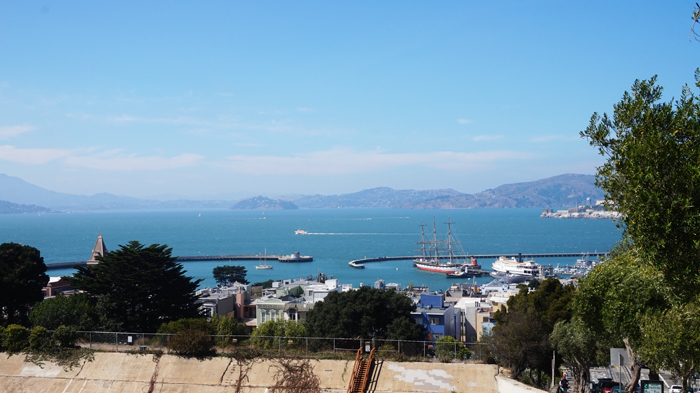 Oh, and it used to be possible to buy tickets for same-day tours of Alcatraz but not anymore. If you want to take the tour that goes ON Alcatraz, you have to book way in advance. I'd recommend at least three weeks.